Our Price $220.00 Another currency? Are you looking to improve your own sales techniques or those of your sales staff? This 20 hour course is unique to the industry. Written in conjunction with professionals in the field and the Australian Garden Centre Association, it concentrates on the art of selling particular to the garden centre trade. Great salespeople are fundamental to every business and garden centres are no exception. Knowing how to deal with customers is more than just a friendly face; sales-staff that understand the fundamentals of customer service and the techniques used to gain sales (along with plant and product knowledge) are set to do well in this business. Garden centres trade in a highly competitive environment and great sales staff will also help a business survive and thrive. 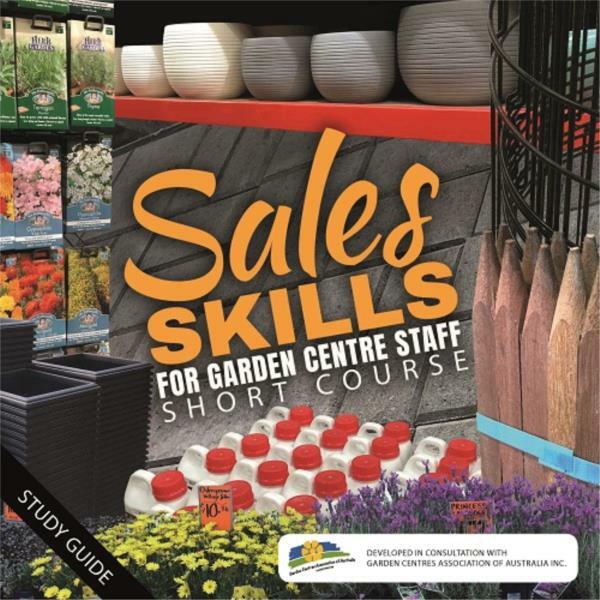 •	Garden centre sales assistants who would like to (or need to) improve their knowledge of sales and sales skills. Many nursery sales assistants are passionate about plants, but lack the necessary sales skills to boost sales. •	Small garden centre owners who would like to improve their own sales skills. •	Larger garden centres requiring an achievable course for their staff where they know that what is covered has been vetted by the industry. •	School leavers wanting to gain a foothold in this business. •	It is an achievable online 20 hour course that will extend practical skills in sales. •	It has industry input. •	It is an accessible course: expands sales skills in a non-intimidating, yet informative way. •	It allows the student to progress at their individual pace and also assess their own progress at the end of each lesson through multiple answer test questions and with a larger ‘test’ at the end. •	It encourages pride in selling. •	Learn sales skills: how to open and close sales. •	Learn the importance of plant and product knowledge. •	Learn the principles of marketing and marketing techniques and the law and ethics in selling. •	Learn the importance of presentation, personality and communication in selling. •	Learn how to gain and keep customers and measure sales success. •	Become a confident professional in this field. This is a perfect course to improve your sales skills or those of your sales staff. What is a ‘Reasonable’ Mark Up?